The famed linen cloth preserved in Turin Cathedral has provoked pious devotion, scientific scrutiny, and morbid curiosity. Imprinted with an image many faithful have traditionally believed to be that of the crucified Christ "painted in his own blood," the Shroud remains an object of intense debate and notoriety yet today. In this amply illustrated volume, John Beldon Scott traces the history of the unique relic, focusing especially on the black-marble and gilt-bronze structure Guarino Guarini designed to house and exhibit it. A key Baroque monument, the chapel comprises many unusual architectural features, which Scott identifies and explains, particulary how the chapel’s unprecedented geometry and bizarre imagery convey to the viewer the supernatural powers of the object enshrined there. Drawing on early plans and documents, he demonstrates how the architect’s design mirrors the Shroud’s strange history as well as political aspirations of its owners, the Dukes of Savoy. Exhibiting it ritually, the Savoy prized their relic with its godly vestige as a means to link their dynasty with divine purposes. Guarini, too, promoted this end by fashioning an illusionary world and sacred space that positioned the duke visually so that he appeared close to the Shroud during its ceremonial display. Finally, Scott describes how the additional need for an outdoor stage for the public showing of the relic to the thousands who came to Turin to see it also helped shape the urban plan of the city and its transformation into the Savoyard capital. 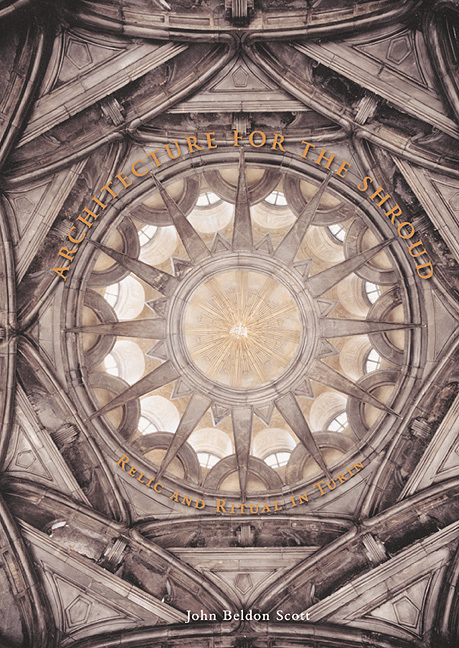 Exploring the mystique of this enigmatic relic and investigating its architectural and urban history for the first time, Architecture for the Shroud will appeal to anyone curious about the textile, its display, and the architectural settings designed to enhance its veneration and boost the political agenda of the ruling family.